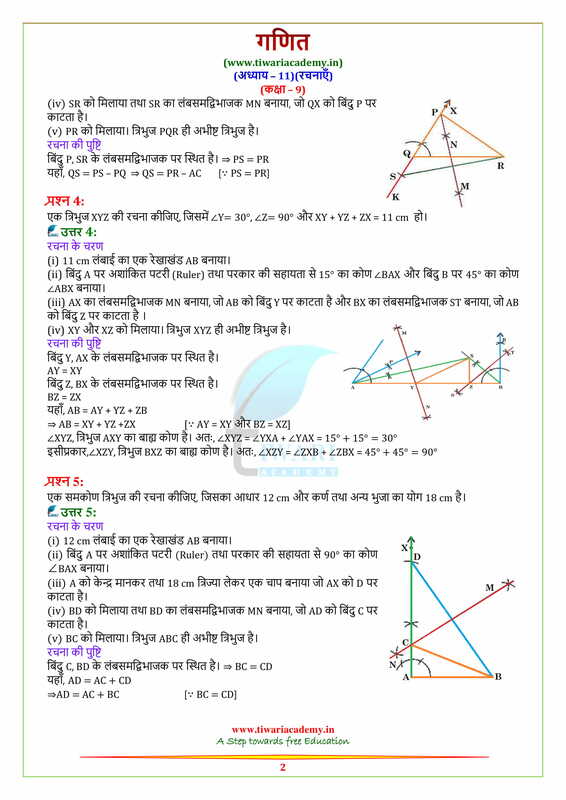 Download NCERT Solutions for Class 9 Maths Chapter 11 Constructions exercise 11.1 and 11.2 in English Medium and Hindi Medium free to use online. 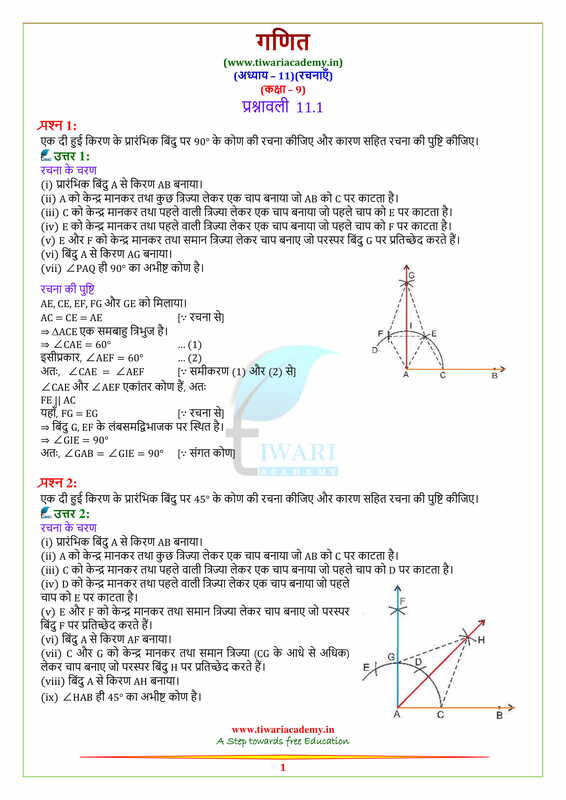 NCERT Solutions for class IX maths all chapters in PDF download are also given here. 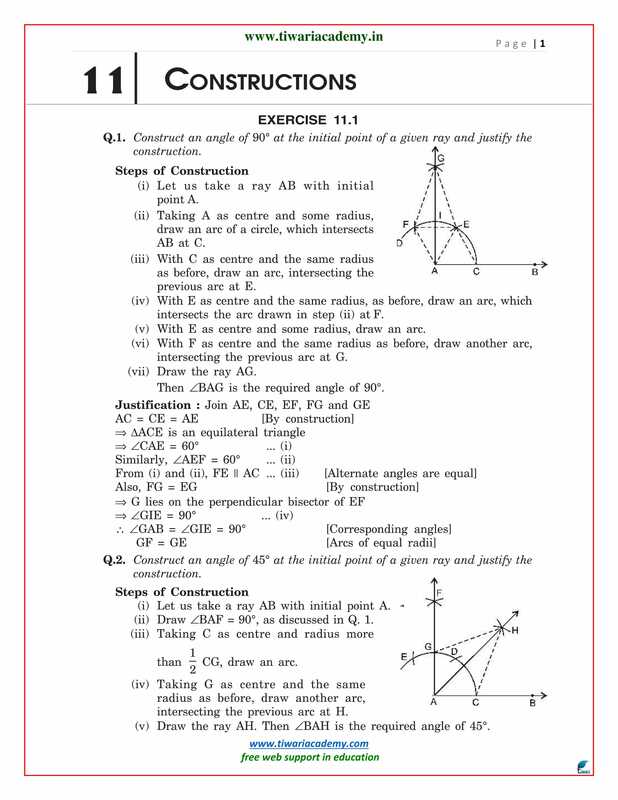 NCERT Solutions for other subjects with complete explanation of each questions are given for free to use. Draw a line segment of 7.2 cm and bisect it. Also measure each part. Draw perpendicular bisector of AB = 6.4 cm. Draw a line segment PQ = 8 cm. Draw a perpendicular at P.
Draw a line AB = 7.9 cm and draw perpendiculars at A and B. Are these two perpendiculars lines, parallel to each other? Draw an angle ABC = 32° using protractor. 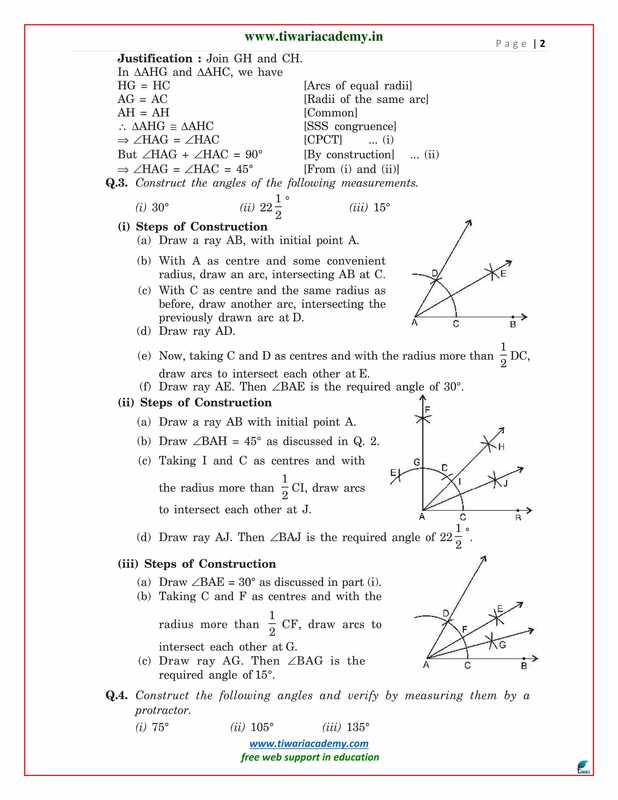 Construct another angle equal to angle ABC using compass. Construct the angles of the following measurements using compass: 90°, 22.5°, 15°, 75°, 105° and 135°. Construct a rhombus whose side is 3.4 cm and one of its angle is 45°. Construct ∆XYZ in which XY = 4.5 cm YZ = 5.0 cm and ZX = 6.0 cm. 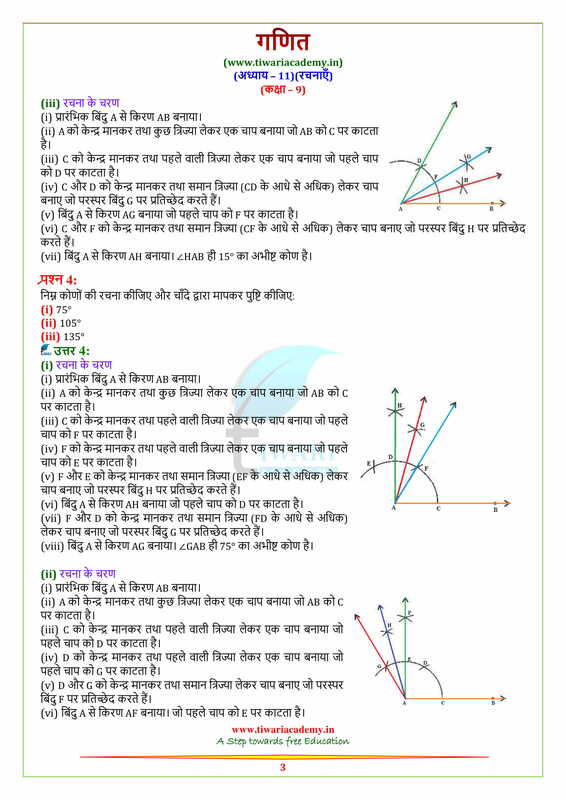 Also draw angle bisector of largest angle. Construct an equilateral triangle of side 6 cm. and label its vertices as P, Q. and R. From point Q draw a median QT. Draw a line segment AB = 13.2 cm Find AB using ruler and compass. 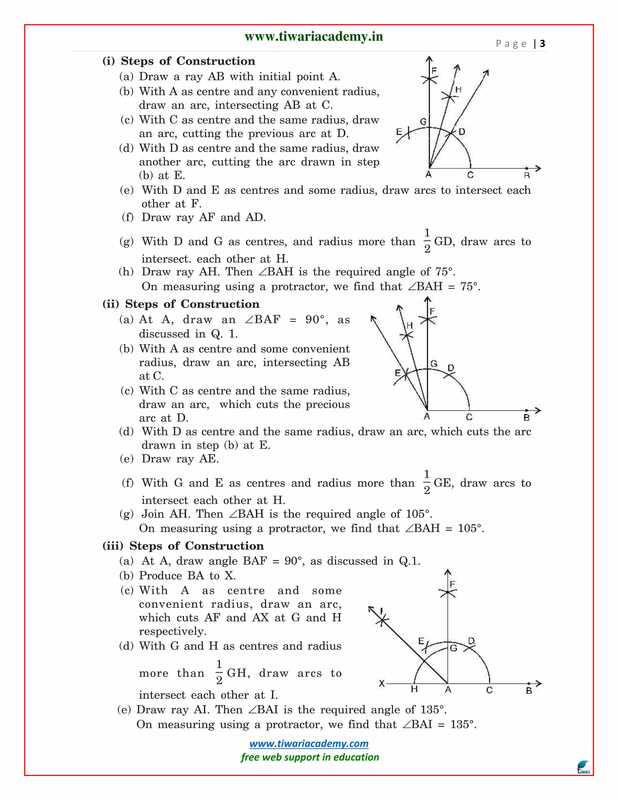 Write steps of construction. Constrict a right triangle ABC, angle B = 90°, AB + AC = 10 cm and BC = 6 cm. 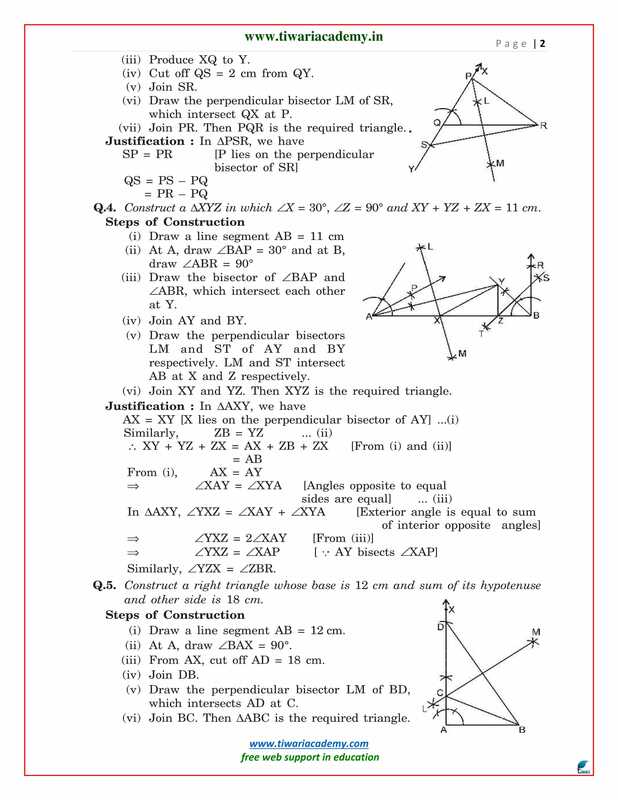 Construct a ∆PQR in which QR = 7 cm, angle Q = 75° and PQ + PR = 13 cm. 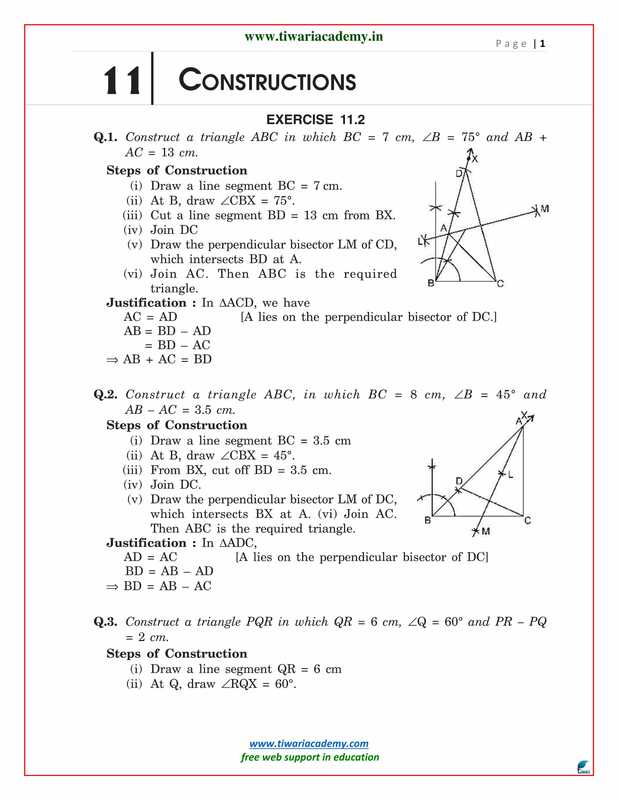 Construct a ∆PQR in which QR = 6 cm, angle Q=30° and PQ – PR = 3 cm. Construct a ∆XYZ in which YZ = 4.1 cm, angle Y = 45° and XY + XZ = 6.7 cm. 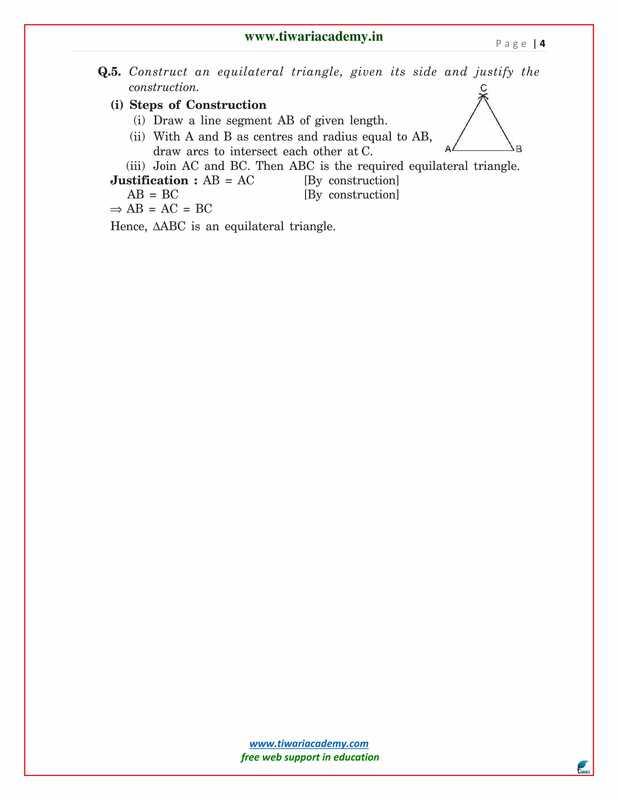 Construct a ∆PQR in which QR = 5 cm, angle R = 45° and PR – PQ = 1.6 cm. Construct a ∆XYZ in which Y = 30°, Z = 90° and XY + YZ + ZX = 11 cm. Construct a triangle ABC in which angle B = 45°, angle C = 60° and the perpendicular from the vertex A to the base BC is 4.5 cm. Construct a triangle with perimeter 12 cm and ratio of their angles are 2:4:5. Government wish to make an old age home of right triangular shape. If one side is 13m and sum of hypotenuse and other side is 15 m, then a) Construct the triangle taking measurement in cm, b) What values are depicted here? Eco club of a school created a triangular park ∆ABC to maintain greenery of the school. If BC = 7 m, angle B = 75°, AB + AC = 13 m, then a) Construct ABC taking measurements in cm, b) What values are represented here. Draw a line m and take a point P which is not on m. From point P draw n || m.